Love the card! and the french are known for "love" so yeah; very French in a roundabout way! Thanks for sharing! You made this bold print stamped image so lively and bubbly! And I love how the sentiment is delivered! Looking forward to try one like it. This card is lovely, and I enjoyed seeing the background stamp as a focal point instead of hidden behind other images. Beautiful! Fabulous heart background and gorgeous card! Thanks for the inspiration. Loving this kit more and more. Such a wonderful watercolored background and elegant card, Libby. Really highlights how versatile the background stamp can be! TFS! This card is beautiful; the imperfect look is great ! Thank you Libby for this sweet card sample....so pretty. I am loving this new upcoming kit...can’t wait to get it. Happy New Year Hugs!!! I was thinking about getting the heart stamp add-on and I am so glad to see that you made your card with that stamp. Thank you! The hearts look really sweet. Nice card--nice use of a background stamp. Cute card. Looking forward to making my valentine cards. I love making cards and yours is pretty sweet I'm new to card making and I think I could make some of these as your explanation is very good. Thanks for the opportunity! So sweet! Love your watercolouring! Darling card, Libby! This kit totally reminded me of you, so I started with a purple bike and ended up with purple everything! Great simple card! This whole set is so much fun! I can't wait to get it! Thanks for sharing! Great card. Simple and special! Your card is so sweet. Lovely job! Thanks for sharing! 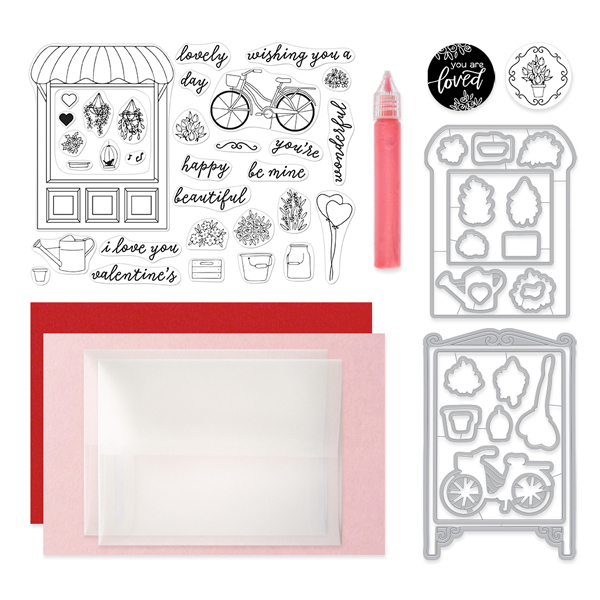 I love this kit so much, all of the cards and examples have been so lovely and this kit really can be used in so many ways. I love hearts! Beautiful card and watercoloring! Love the background stamp you used to create your card. Hearts are one of my favorite things to design cards with. They add a real human touch. I love the Hero Arts January card release and am thankful for the opportunity to win one. Great use of that wonderful background as a focus! Super card, Libby! Thanks so much for the all the wonderful inspiration and the chance to win! What a lovely card! Too cute!!! Cute card. Thanks for sharing with us. I am so loving this latest kit. Your card is adorable! I love the perfectly imperfect stamping. Great job! Very good idea to watercolor the little hearts from the stamp! Thanks for sharing! Lovely card using this fabulous kit! I love that you did a different kind of card. It's wonderful! Thanks for sharing! Love your card with the watercolors! Beautiful card! Love the background you created! This card says it all to that special someone. Nice job and this kit is so versatile. So many hearts! I love your cards. They are so beautiful. Keep up the amazing work! Great cards and inspiration! Lovely kit! Your card is loved......by me! love the "messy" coloring look! adds so much to a simple card design! love your background ... very nice! I throughly enjoyed this blog hop showcasing this kit. You are so lucky to be able to participate. Love what you did with the heart background! It looks like you drew each heart by hand! You made such a beautiful card! I love blue around the edges. It looks amazing. Pretty card! Love all those hearts! 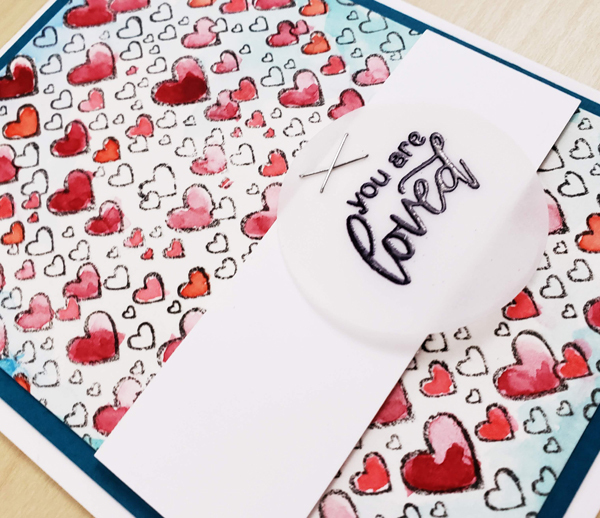 Even though it may have been a quick watercolor, it looks amazing and is the perfect fit for that background stamp! I like the way you colored this one! Nice card, I love this background stamp! Cool idea to watercolor in some of the hearts in the background!! Hearts are always fun and the way you have colored the hearts gives a feeling of all the heart just floating upward. Wonderful card - it is very light-hearted (no pun intended!). That loose look makes it seem like you hand sketched each of those hearts and coloured them by hand. I love it! I dig you you used the heart background stamp and the blue accents really make the card pop I feel. I say very French! A fun card to create and view! Hi Libby - great card - love the look and I love how you adhered the vellum circle to the card. I am going to search my background stamps and see what I can come up with. Libby, your card is very sweet and adorable. I love that background! 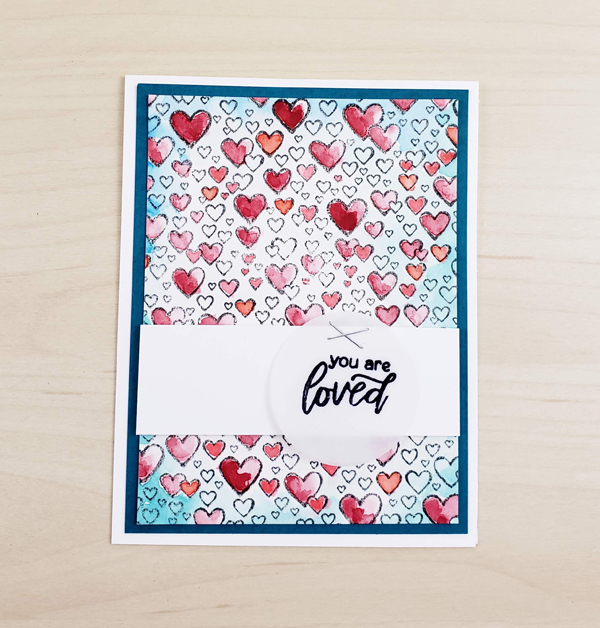 Oh my goodness, I love what you did with the heart background stamp! So beautiful and a completely different look for this stamp! Thank you for sharing! So cute with all of the hearts. Love the touch of vellum on this sweet card. Thanks for sharing your creativity. This is such a fun card, love the loose coloring and the fun. Very pretty card - so fun! This is a great kit and I love all the inspiration! I love your card! The colors are just so pretty together! I really like that the hearts are not stamped perfectly as it can sometimes look harsh, this is such a nice, softer look. What a fun card those multiple hearts look like bubbles. Thanks for sharing your talent. Really like all the hearts. Such a cool look.